A teenage driver lost control of her car while she was livestreaming on Instagram and recorded part of the crash that authorities say killed her younger sister in California. This July 22, 2017 photo provided by the Merced County Sheriff, shows Obdulia Sanchez in Merced, Calif. Sanchez has been arrested in California on suspicion of causing a deadly crash that she recorded live on Instagram. She was booked into the Merced County Jail on suspicion of DUI and vehicular manslaughter after Friday's crash that killed her 14-year-old sister and badly injured another 14-year-old girl. After a gap in the livestream, the driver is seen leaning over the body of the girl, trying to shake her awake and saying she was sorry. She said she expected to spend the rest of her life in prison but doesn't care. 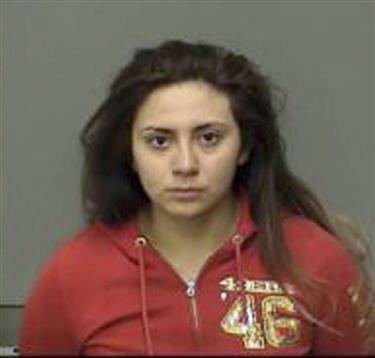 Authorities say Obdulia Sanchez, 18, was driving the car Friday when it veered onto the shoulder of a road about 75 miles (120.7 kilometers) northwest of Fresno. She overcorrected, causing the vehicle to swerve and overturn into a field, ejecting her sister, the California Highway Patrol said on Monday. Jacqueline Sanchez, 14, of Stockton died in the crash, Merced County Sheriff Vern Warnke said. Another girl, also 14, was in the backseat and survived with a leg injury. The driver was wearing a seatbelt but not the two girls, the CHP said. The teenagers' father, Nicandro Sanchez, told Fresno television station KFSN he has seen the video and that he believes the crash was "an accident." "It's an accident," Nicandro Sanchez said. "It happened that way. Who knows why?" He said he hasn't spoken to Obdulia but he believes she knowns she did something wrong but doesn't know what happened. "What I think is she knows she's done something wrong. Because she knows, and that's what I feel. She feels bad for herself, but she killed her own sister," he said. Nicandro Sanchez said Obdulia had a difficult childhood and graduated from high school last year. She was in the custody of Child Protective Services the past two years, he added. Obdulia Sanchez was arrested on suspicion of drunken driving and vehicular manslaughter and remained in jail with bail set at US$300,000. The livestream was recorded on Instagram and posted on Facebook by someone who had seen it. Stockton resident Mary Hernandez said she saw the video there and reposted it. "People need to know these things can happen," Hernandez said, adding that she had gotten a range of responses from anger to gratitude. "I mean no disrespect to their family for posting it," she said. Hernandez said she knew about Obdulia Sanchez through social media, but they never met in person. Rob Carroll, a chief deputy in the Merced County District Attorney's Office, said he had not yet seen the video. But he expects it will be a key piece of evidence. "Drinking, driving and driving erratically — obviously those are poor choices," Carroll said. Relatives have set up a GoFundMe page to pay for the funeral of Jacqueline Sanchez. The page says she was planning to celebrate her 15th birthday — known as a quincenera — on Sunday. Her parents, however, told the television station Jacqueline was going to be confirmed in a Catholic church. She is expected to make her first court appearance Wednesday.